Greetings, it seems as if it has been ages since I crafted and blogged. I made a few things in advance to post while Hubs and I visited family for the Easter holiday. Our trip went by quickly, even the 8 hour drive to get there and what should have been an 8 hour drive home but ended up being 11 hours by the time we navigated weather and a quick stop on the way home for pizza---who wants to cook after a day in the car? I made this card around the second week of April, and it was involved. I decided I wanted to make my own stencil to use with embossing paste. 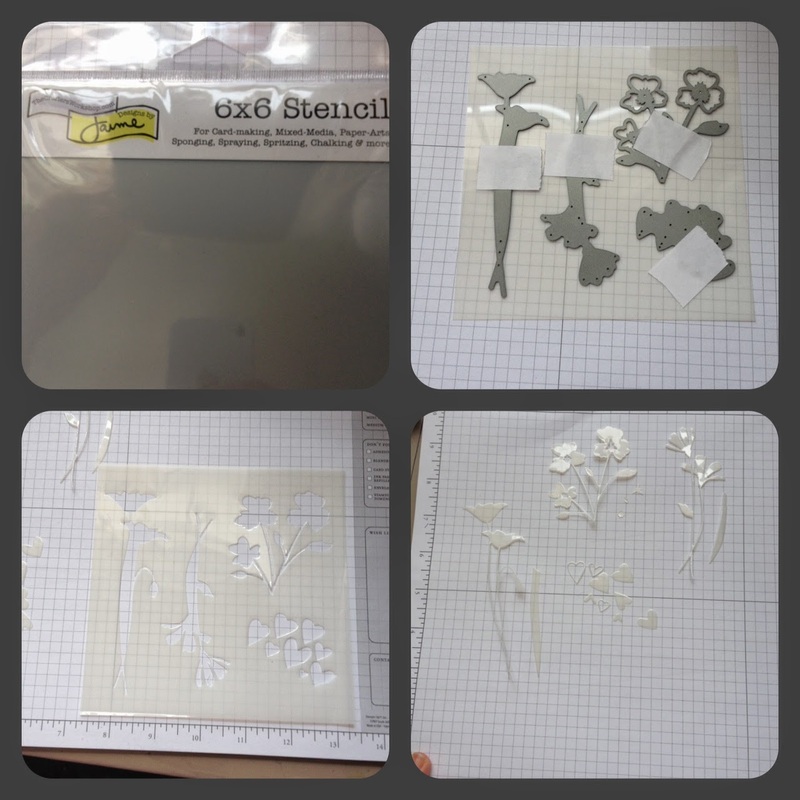 I had several flower dies that I thought might make good stencils. I even took a couple of pictures of the process. 1. 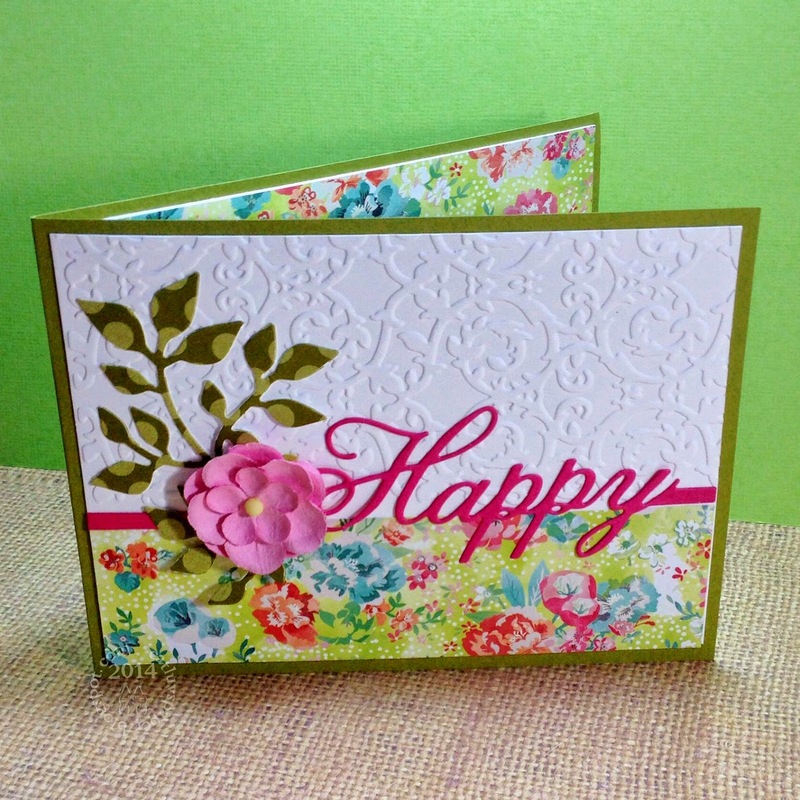 Stencil material - I used The Crafters Workshop 6x6. 3 sheets included for about $6.00. 2. Tape down dies so they don't move, you will need to run it several times to get clean cuts. I also used a metal shim in my cuttlebug. 3 & 4. Remove your pieces and keep them all. I put re-positional adhesive on the backs of the stencils, because they are small and I don't want them to move during use. The adhesive did not leave any residue on the paper when I pulled them up. This card was for the Card Chain Challenge over at Society of Stampaholics. It runs each month with a sign up through mid-month, then the reveal at the end of the month. You make a card and get a card. It is a fun exchange. This month I got to send my card to Judy, she has received the card and now I can share it. 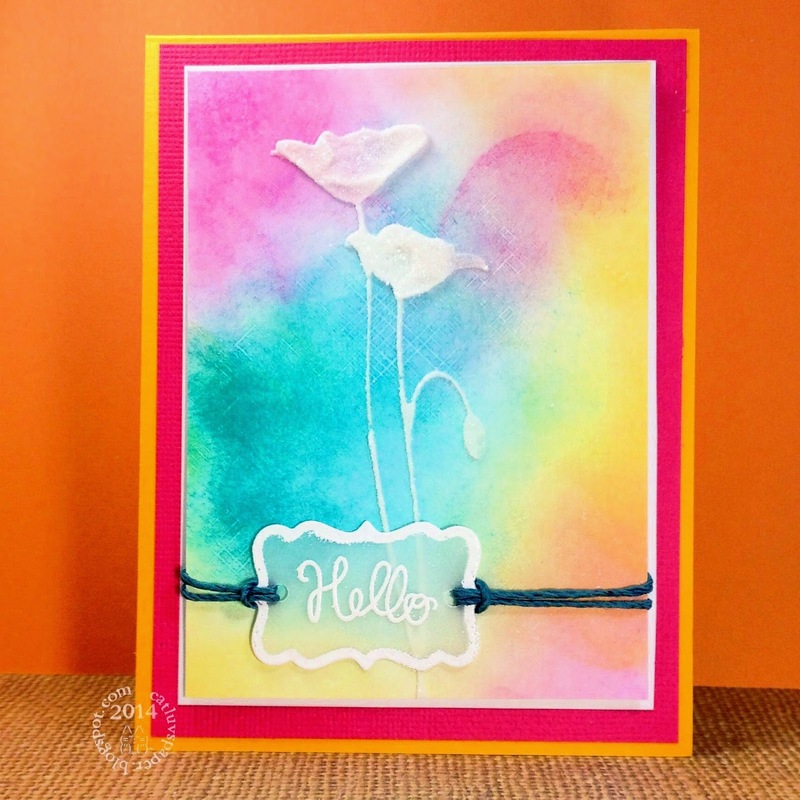 I used the colors that Deborah gave us - (one of many card creation choices) to create a background for my embossing paste and glittered poppies. I also added bits of those colors to the card base, mat, and twine to bring it all together. The embossed frame around the die cut vellum was created by putting versamark on the underside of my die before I cut the vellum with it. After it was cut, I added the embossing powder and heated it. I love that look on vellum. If you are free on Saturday May 3rd at 2 pm Eastern time, I will be hosting a card scramble over at the Hero Arts Flickr group. You will need to have at least one Hero Arts- Digi Image, Large Stamp, Stencil, or Die Cut to participate. 90 Minutes to make and post your card using the theme I provide at the start. Hope to see you there! Thanks for stopping by. All papers and stamps are from the March Simon Says Stamp card kit, I added some Hero Arts embossing powders and some enamel dots from Doodlebug. Hubs and I made it into Washington DC to check out the Cherry Blossoms. It is a day despite the crowds and limited parking that I always enjoy! 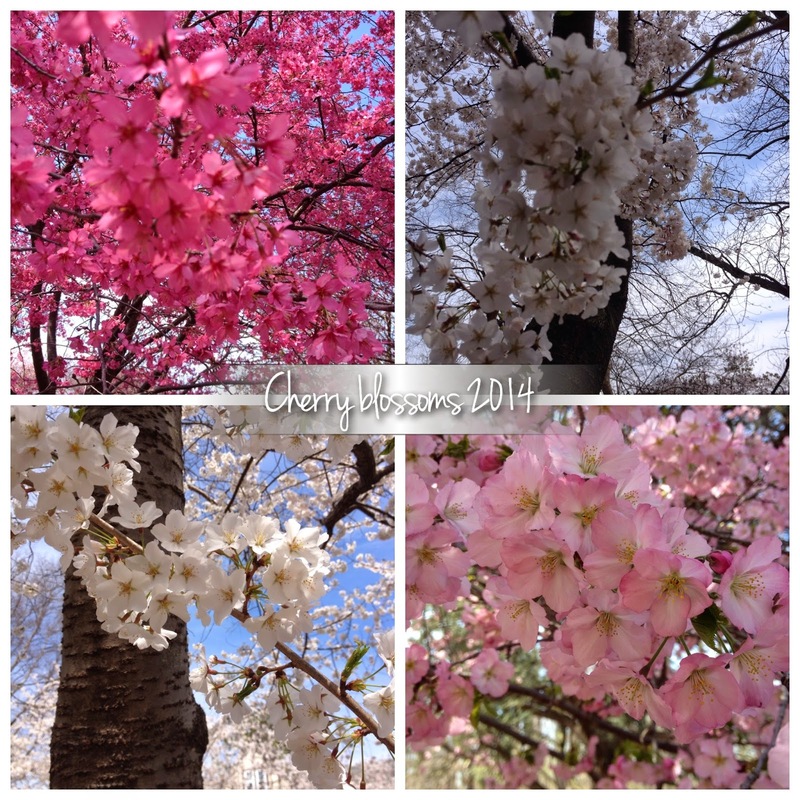 There are several places in the area that one can enjoy the blossoms. The tidal basin near several monuments is the most crowded, neighborhoods in Georgetown were very quite and peaceful, and we saw a wide variety cherry trees at the National Arboretum. The light pink double petal ones are my favorite, and they all seem to smell so good. It is a little bit sad to see the petals rain down when a gentle gust of wind goes through, but the petals floating slowly to the ground is also quite an awesome sight. I made a few different Easter cards, and I really liked how this one turned out, so I am sharing it. Thank you so much for stopping by. A quick card share here. A thank you card which I am entering in the second challenge over at Virginia's View. We were given a insipration photo and an instruction to use stenciling. I was inspired by the upper left photo, I liked the white images on the colored circles. I decided to ink a panel in colors you might expect the main image to take, green for grass, blue sky and yellow flowers, then I spread embossing paste through a stencil onto that inked panel. I added a greeting in black ink and mounted the card on a yellow card base. Of course I had to add some distress clear rock candy glitter to the wet embossing paste...I am addicted to that stuff. Another family birthday. There are far more men in our families than women. I get a lot of practice with the guy-cards. This week I have been very busy but decided I wanted to get my Muse Challenge #62 card made. I am often a very late contributor to the Muse challenge. This week it is at the top of my list! Here is our image from Muse Vicki Dutcher. I have a particular fondness for the combination of Red White and Black, those were our wedding colors. I went with an inverse of the colors, making red my main, with white and black accents. I love Vicki's emphasizing of one word with the different color, font and the pop up. I pretty much followed her card and layout because it is fantastic. 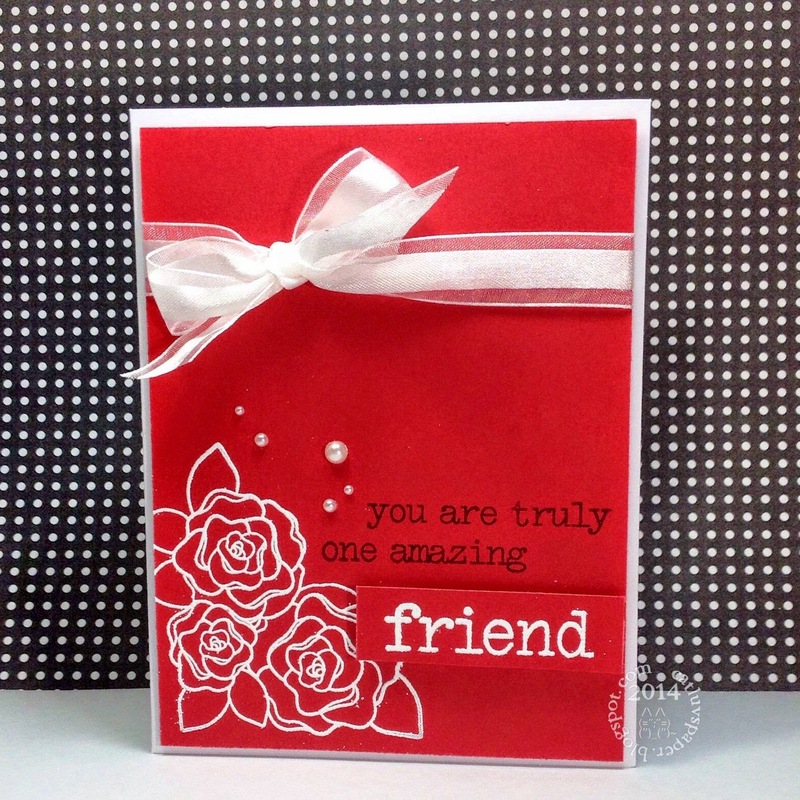 My stamps and embossing powder are from Hero Arts, the ribobn from Michaels, the pearls from Stampin Up as is the cardstock. Versafine onyx black and VersaMark are the inks used. Thanks for stopping by! I have no idea what the style of this card would be, perhaps clean and layered. 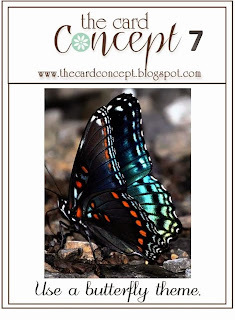 I am entering it in The Card Concept Challenge #7, use a butterfly. I love the bluish tones how the butterfly seems to shine. I am also lately enamored with white on white. I cut one butterfly and one butterfly shadow image from a spellbinder set. 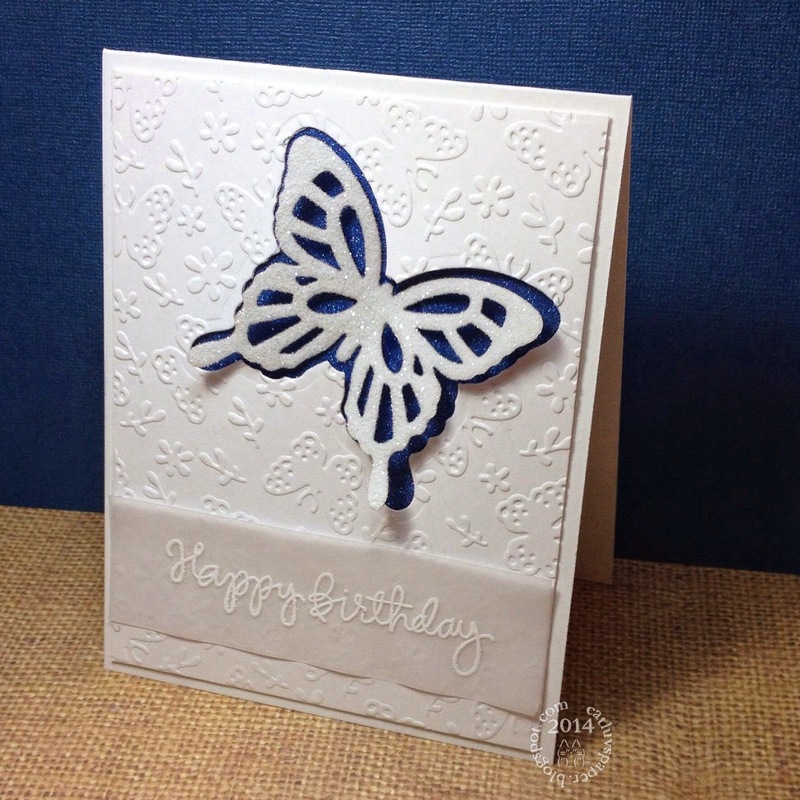 The butterfly image was cut on cardstock with double sided adhesive sheet. The butterfly shadow was cut into a card panel. I adhered blue glitter paper between the card base and the layer panel, which had been die cut and dry embossed. The butterfly image was dipped into rock candy distress glitter. 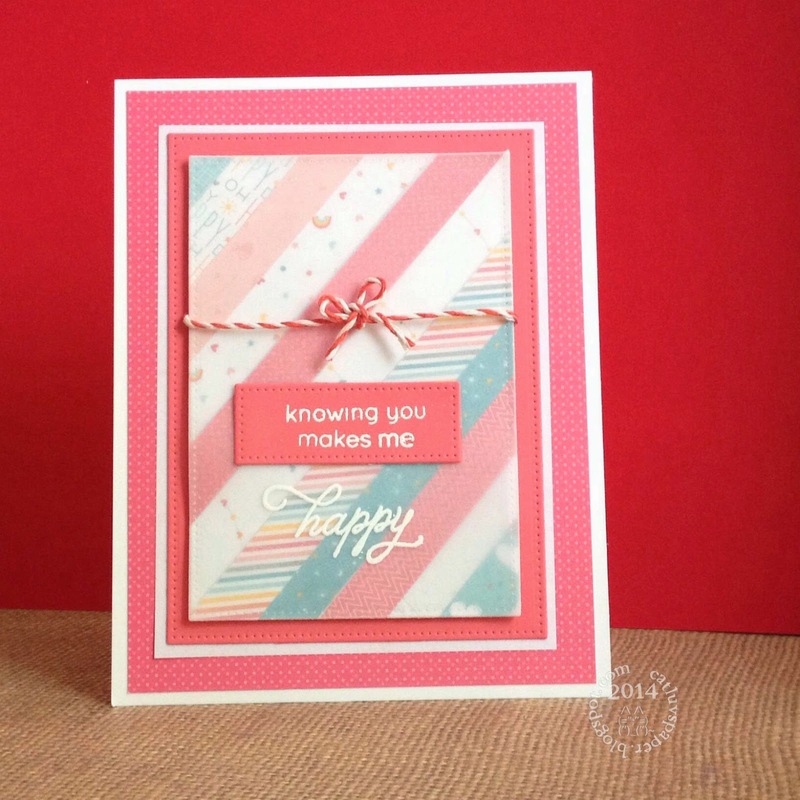 A vellum strip was white heat embossed with a Simon Says Stamp birthday sentiment. Thanks for stopping by. 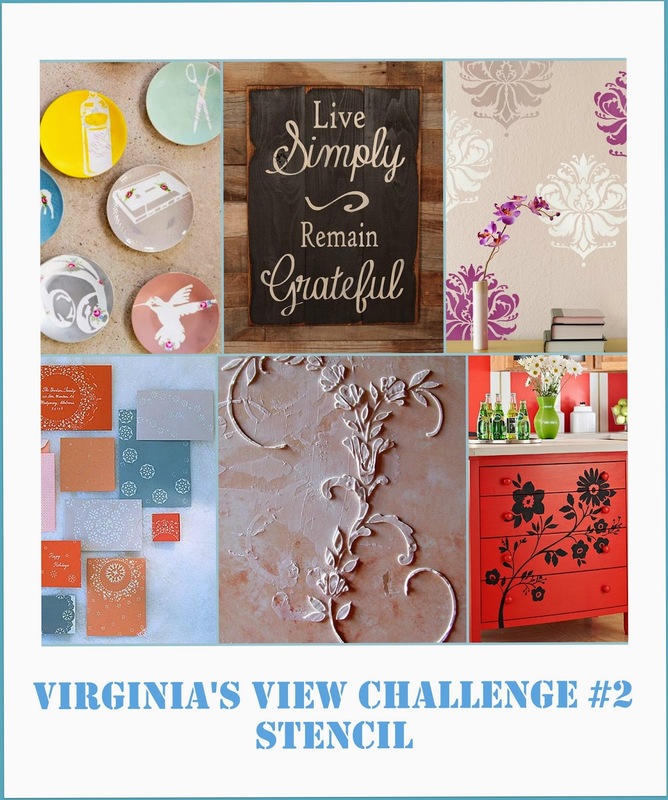 The challenge is open until Monday, 4-14-14 at 12 noon pacific time, US. I was able to play in last Saturday's scramble at the Hero Arts Flickr group. Arlene hosted and our instructions included: using and embellishment and a die cut or punch or embossing folder along with a main image being a hero arts stamp. I grabbed an older set, because the flower reminded me of the Cherry Blossoms in Washington DC. Hubs and I try to go see them every year. It really makes me feel like spring is here when I see them. 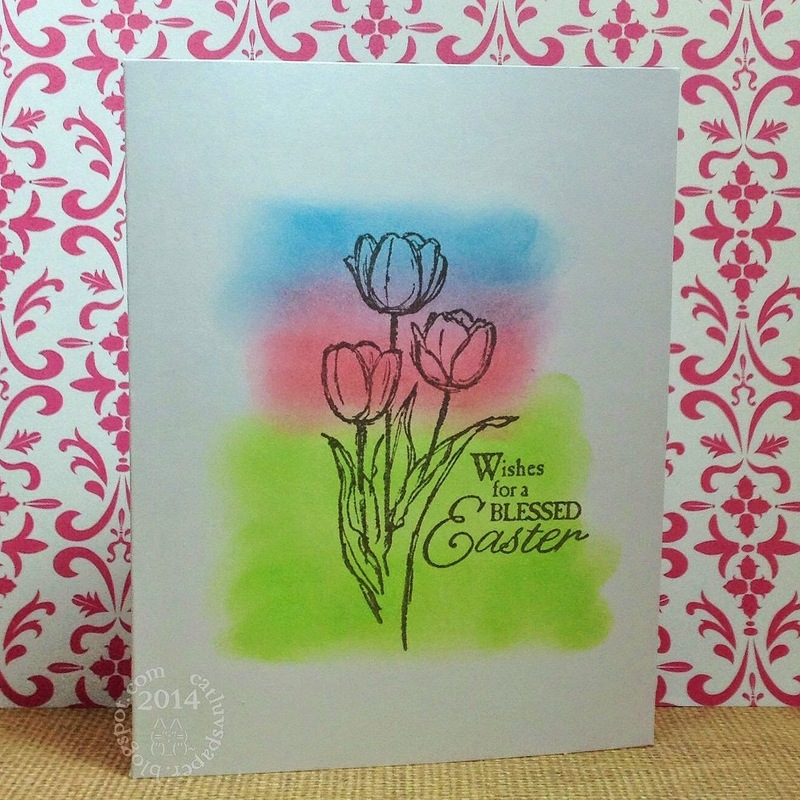 I used vellum with white heat embossing and marker coloring on the back side. 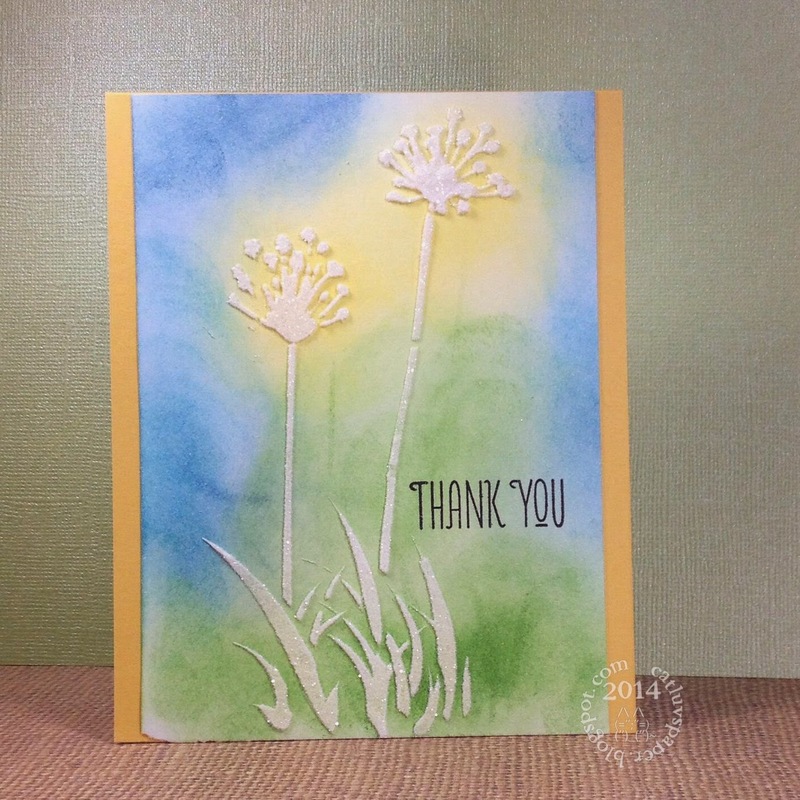 I stamped cut and colored 6 blooms, used 3 of them whole, then cut up two to add some bulk, I wanted the feeling of those bloom clusters to come through on the card. The interior has one blossom on a small branch for decoration. I wanted the flowers to be a somewhat translucent to let the branch die behind the flowers to show through a bit. Here's hoping we all get some more spring like weather and that it lasts as long as this winter seemingly did. 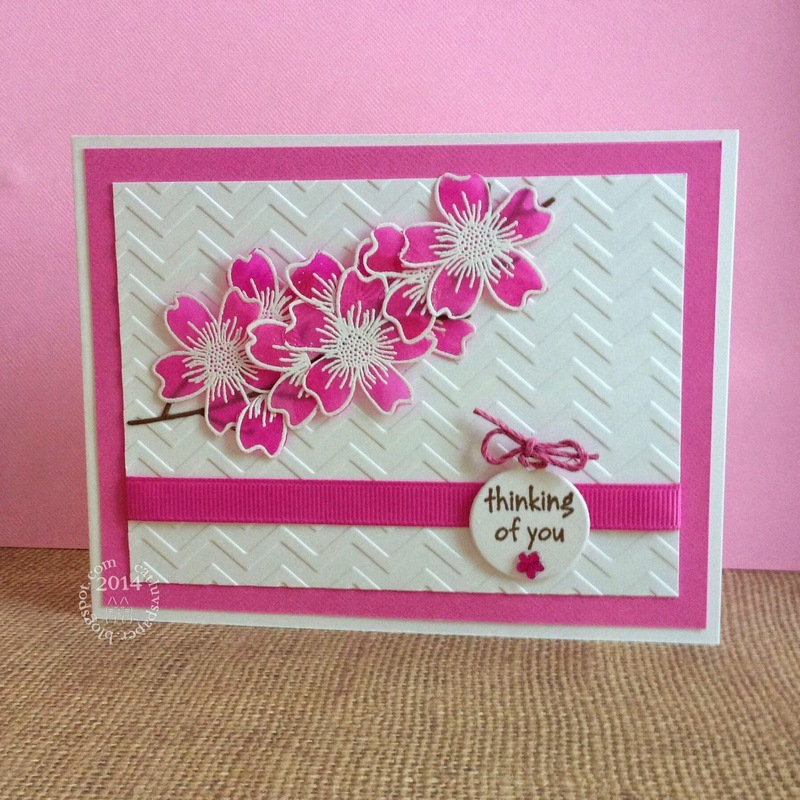 The flower stamps are Heartfelt Creations, the sentiment from Hero Arts! A friend and former co-worker is having a birthday today. I will always remember her birthday as it is exactly 1 week after mine. She loves green, so I try to incorporate it into her cards. 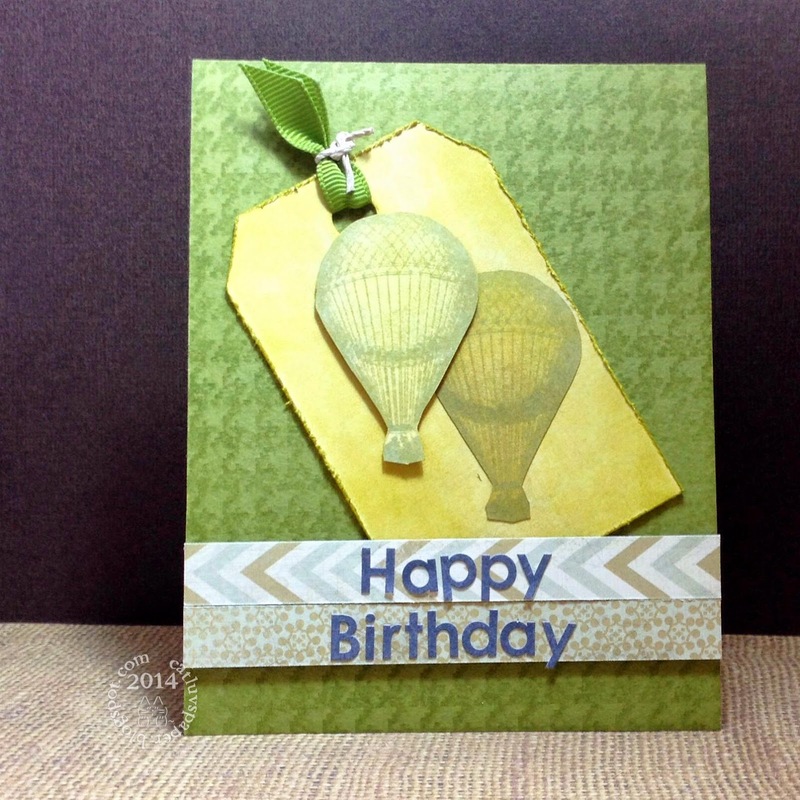 I used a green card base, and some patterned paper from the Simon Says Stamp February card kit. The die cut Happy and the leaves are a gift from Betty (thank you again!) in a card exchange. The pink flower is prima. The interior has just a bit of the same paper at the top and a Hero Arts sentiment inside. The embossing folder is from cuttlebug.